May 1, 2016 – May is Bike Month! And it’s time to get out, ride your bike, celebrate, and pedal to work, school, church, on the road, in the dirt, racing or just riding along! In Utah, Idaho, Arizona, Montana, Nevada, and surrounding states, there are a ton of events happening this month that are fun and encouraging for all cyclists. Bike Month was established in 1956 and is a month long celebration of the bicycle! In Utah, the Governor declares May is Bike Month each year (see the proclamation below). Nationally, festivities are lead by the League of American Bicyclists (bikeleague.org). National Bike to Work Week is from May 16-20, 2016. This is a time to leave the car at home, leave the bus pass in your pocket, and ride your bike to work. The week culminates with National Bike to Work Day on Friday, May 20, 2016. Casual Friday is now Bike Friday! Look for Bike Week events in Bozeman, Boise, Reno, and Utah. 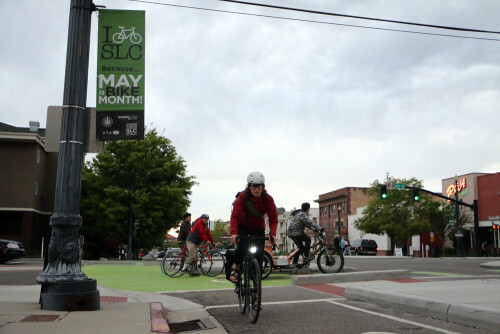 In Utah, there are a number of other planned Bike to Work Days throughout the month. See the calendar below for details. Join your fellow citizens and politicians to encourage more people to ride to work. National Bike to School Day is May 4, 2016. Ride your bike to school, and arrive refreshed and ready to study. The National Bike Challenge starts May 1 and runs through May 31. It’s a great way to highlight your participation in riding this month. For details, see nationalbikechallenge.org. The annual Cyclofemme Ride takes place worldwide on May 8, 2016, Mother’s Day. This is a low key ride for women to ride together. Look for rides in Utah in Salt Lake City, Provo (on May 7), and many other locations (see cyclofemme.com for a full list). If you can’t find a ride near you, the website has details on how to organize your own. Gov. 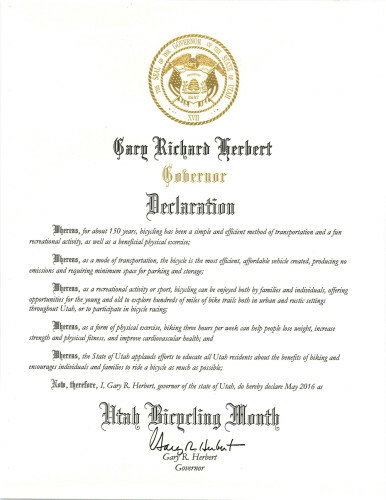 Gary Herbert declared May as Utah Bike Month. The Ride of Silence is a ride to remember fallen cyclists – those who have been killed or injured while riding their bikes. Rides are held in silence and the ride of silence poem is often read before hand. Look for rides in Salt Lake City and Provo, Utah; Prescott, Arizona; Las Vegas, Nevada; and Heyburn and Boise, Idaho. If you want to create your own ride, or find information on rides not listed in our calendar, see rideofsilence.org. There are events including bike swaps to brewery tours to bike to work to bikes for kids. See the schedule below, or look for more in the calendar of events in this issue.